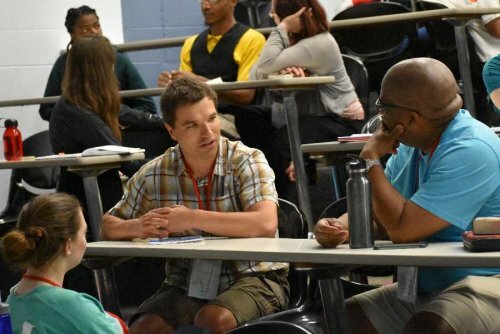 From May 26 to 29, hundreds of young adults from more than thirty US states and others from Canada came together in St. Louis for a new stage in the pilgrimage of trust on earth. A new stage in many ways, for it dealt with the serious questions of racism that have recently arisen in that part of the United States and elsewhere. Following the death of a black teenager, Michael Brown, and the racial unrest that followed in 2014 in the city of Ferguson, the archbishop of that diocese, Robert Carlson, had the idea of inviting the Taizé Community to organize a gathering in St. Louis. The archbishop had been struck by the pilgrimage of trust that was held on the Pine Ridge Indian reservation in 2013. That Native American reservation in South Dakota, and the city of St. Louis, both have in common the fact of experiencing a deep crisis of trust. In both cases, young people in particular are confronted by a seemingly closed future. They no longer believe the promises of political leaders. The Taizé brothers accepted the invitation, under the condition that the meeting be ecumenical and that it could be prepared with all the St. Louis churches for at least a year. For several months, two Taizé brothers travelled around St. Louis and the surrounding region, setting up some forty “evenings of trust.” These evenings were held in Catholic, Episcopalian (Anglican), Methodist, AME Zion, Presbyterian, Lutheran, Baptist and free churches. Both in so-called dangerous neighborhoods (St. Louis is one of the most violent cities in the United States) and comfortable suburbs, each of these evenings began with a prayer service followed by a time of small-group sharing. For these conversations the Taizé brothers, together with a local preparation team, prepared questions on building or repairing trust which could be found on the internet each month. The goal was to spark a conversation which could continue for several months or even longer, not avoiding the ravages of racism and its structural causes. The internet site explained what kind of trust was meant: not a facile and deceptive optimism, but a trust that gives the courage to face reality, which sharpens our view of things and which leads us to be attentive to the sufferings of others. In a word, a trust that keeps us from running away. For some people, thinking about the question in that way was something new. Those familiar with the writings of Brother Roger, though, rediscovered a powerful conviction of the founder of Taizé: a Christian must know how to unite struggle and contemplation. An authentic inner life leads us to open ourselves to the suffering of our neighbors, not to run away from the difficulties that arise but to run towards them. In his talk during the meeting, the archbishop of St. Louis stated: “There are those in our community who unfortunately are paralyzed by fear. There are some who find it easy to turn a blind eye to suffering, and it’s so easy to think that the work of healing belongs to someone else. It’s not my job. […] It is my hope that this pilgrimage is not the culmination of a conversation on trust, not merely the end of a year’s work of preparation and meetings, but rather that the pilgrimage sparks within us a desire to learn more, to love more, to love more perfectly.” The unrest in 2014 caused the churches to reflect on their past practices. 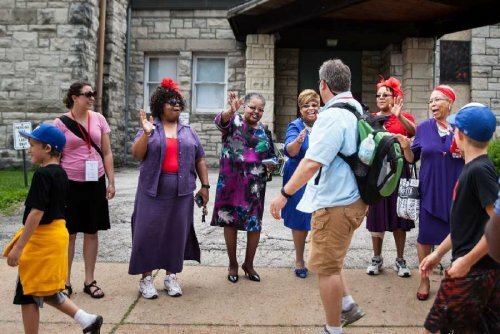 Some have begun to open up new ways, notably thanks to remarkable black pastors, some of whom led workshops during the St. Louis pilgrimage, and, in the Catholic Church as a result of the Justice and Peace Commission that Archbishop Carlson set up after Michael Brown’s death. The chairwoman of that commission, Marie Kenyon, did not hide the fact that in some circles there is still considerable resistance to their work. 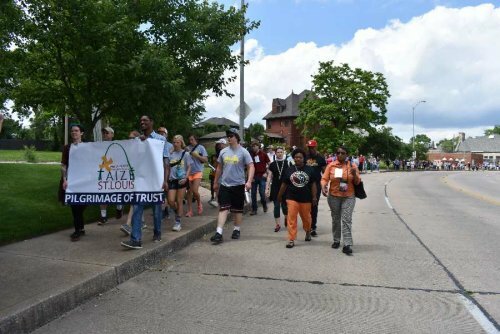 The culmination of the weekend was undoubtedly the “walk of trust” through several neighborhoods of St. Louis, bringing together Christians of all denominations as well as Jews and Muslims. Everyone could choose their starting-point for the walk: a synagogue located in the west-central part of the city, the Catholic cathedral (the bells rang when the walk began at 2pm), or a Presbyterian church in the same neighborhood. The different groups met on Delmar Boulevard, the sad symbol of a divided city and of glaring inequalities. There is a difference of eighteen years of life expectancy depending on which part of the city you live in. The participants walked along Delmar Boulevard, discovering abandoned streets and boarded-up houses following the “white flight” some years earlier. On the way, a moving moment occurred in front of an African-American Baptist church, where the church members greeted the walkers. There were three stops along the way. Each time, someone spoke and prayed. Gathered in the parking lot near the headquarters of the Daughters of Charity of the region, hundreds of people listened to Pastor Willis Johnson, from Ferguson. His talk was followed by a prayer spoken by a delegate of the nearby Baptist church. 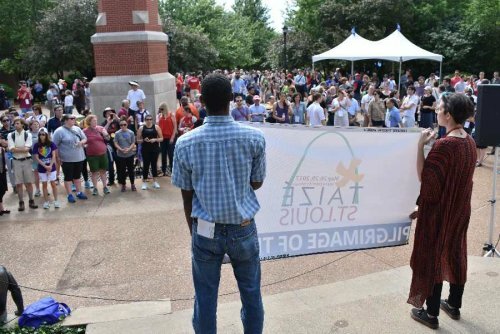 Walking along Lindell Boulevard, approximately 1000 participants gathered on the campus of St. Louis University, founded by the Jesuits. By chance, an Islamic center is a kind of enclave on the campus. 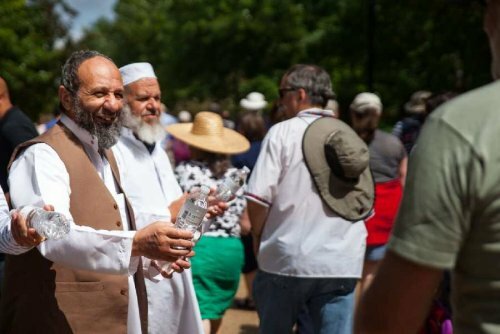 The brothers had made contact with the leaders and, when the crowd arrived, there was a joyful welcome, with Muslim believers in different garb distributing water bottles and greeting the walkers. He: But Mom, why did they stop me? I was just coming home. She: The police stop a lot of young black men. He (a proud twelve-year-old trying to hide his emotion): How long is this going to last? She (taking a deep breath, hesitating a moment but not wishing to hide anything from her son): For the rest of your life. When she spoke these words in her talk, all those present were extremely moved. Amy also led a workshop on Saturday afternoon. At the third stop, a rabbi spoke. His words were turned towards the future: how can we prepare little children for an identity expressed as “we” and not as “them” and “us”? With a lot of sensitivity he shared with the crowd the initiative of the founders of “We Stories” and the effects of this training on his own children, especially the youngest. This initiative is directed to white families who have often lived in a “bubble” and have no experience of ethnic diversity. All the walkers then entered the Chaifetz Arena, a large sports hall located at the southern end of the university campus. The archbishop’s words were followed by those of an important figure of African-American Christianity in the United States: Pastor Traci Blackmon, who was a counselor of President Obama for questions linked to racism. 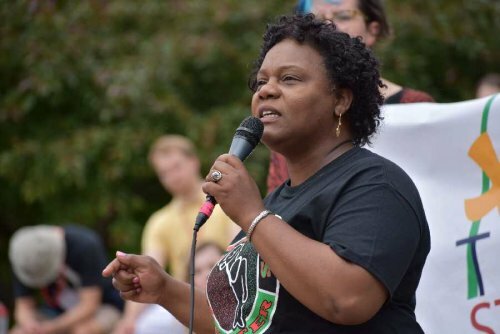 Pastor Blackmon was present and active during the Ferguson events and many people believe that, thanks to her, the situation did not degenerate into total chaos. Her voice is always heard when the poor are mistreated and racism rears its head. In her talk, she insisted on the importance of acting on several levels. “Systemic” changes are necessary, for systems perpetuate injustices. At the same time, she insisted on the necessity of the inner transformation without which systemic changes will never be effective. Who wants to continue the evenings of trust in the city and surrounding area of St. Louis? Who wants to reflect on systemic changes? Who wants to find ways to cross the borders that separate us? Who wants to remain close to the most vulnerable members of our society? This made it clear that the pilgrimage was only a beginning, a humble parable called to foster other initiatives close at hand and far away.